Throughout the tenure of this blog, I hope to discuss some of the sport heritage sites I have been able to visit over the years. While I have termed these “reviews,” I am perhaps less preoccupied with a more Trip-Advisor-esque “should you visit here?” kind of commentary. Rather, I am interested in what is presented, how it is presented, and what kinds of heritages are highlighted (and ignored). Of course, praise/critique may find its way in to this commentary, but I hope to highlight more about what sport heritage these sites present and how they present them. 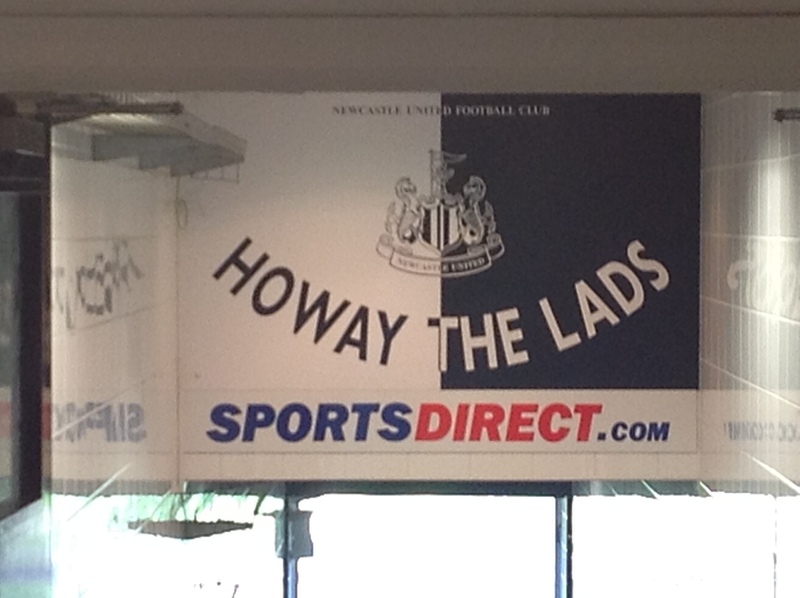 The tour of Newcastle United’s home ground, St. James’ Park, is the focus of this site review. If you are not familiar with the ground, its history, and the recent controversy over its name change (at the time of the tour in 2012 it was called Sports Direct Arena – though the corporate name has since been abandoned and the original St. James’ name has been re-instated), there’s a good backgrounder available here. Needless to say, it is one of the largest stadiums in Premiership football and, through various incarnations, has been used by Newcastle United Football Club (NUFC) for well over a century. If you have ever been on a stadium tour, most tend to follow a very similar pattern. They are meant to reveal something of the “backstage” of a familiar venue, providing the both the dedicated fan and curious observer a chance to see places not normally accessible to the general public. Therefore, most stadium tours (which almost invariably begin and end at the team shop) will visit the luxury suites, the media centre, some of the other private rooms and hospitality areas, the view from the “best seats in the house,” and so on. Many tours will allow access to the change/dressing rooms, particularly in the off-season, and some will allow access next to (though, in my experience, never on) the playing surface. Some tours will have a subtle sales pitch (mentioning that particular places in the stadium are available for private rentals, for example), and most venues will offer tours year-round and often on a daily basis, depending on demand. Stadium tours have garnered some academic interest (including from yours truly), though a great place to start is with Gammon & Fear’s research about tours of Millennium Stadium in Cardiff. 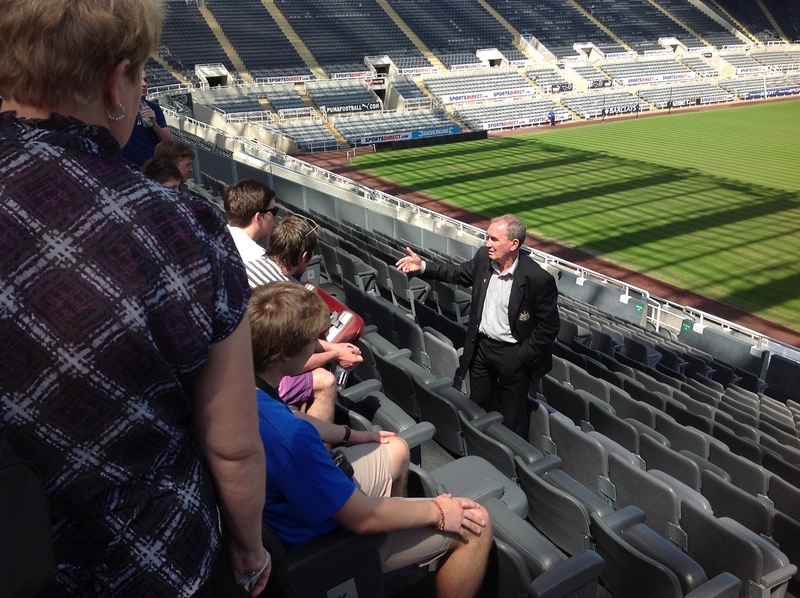 The tour of St. James’ Park was, really, no different than other stadium tours in terms of pattern – though, I did find it probably the best stadium tour I have ever experienced. Perhaps this is because I had a bit of nostalgia about the place. I lived not far from it while doing my Masters degree, attended a few games while living in Newcastle, and subsequently became a fan – albeit a casual one if compared with many of my fellow tour patrons. The guide was also a local, long-time fan from Jarrow, as well as an employee of the club, so he could tell many “unofficial” stories about players, teams, and his own life-long spectating experiences. In many ways, because the guide didn’t appear to follow a team-mandated script, his commentary felt intimate and authentic. For example, he kept referring to the venue as “St. James’ Park” – and even said that “they” (seemingly, the team owners and management) wanted him to use corporate “Sports Direct” name, though he refused. There has been some research (albeit in a very different context) that suggested that first-hand commentaries about a location – in other words, the personal narrative of the guide’s experiences there – may be more important for visitors than seeing the toured venue itself. I suppose this combination of my own background and a guide that was really and truly a team supporter (even going so far as to criticize the team’s recent performance at points during the tour) made the tour something very special. It didn’t feel like the regular, old Wednesday afternoon tour, if that makes sense. One of the other aspect that made this tour memorable was the sheer level of access the tour provided. Indeed, the tour did follow a familiar pattern in terms of visited locations, but we did get to linger in both the home and visitor changing rooms, the pitch-side visit went around to the other side of the field (along the touch line, of course), and the guide even allowed visitors to sit in the players’ chairs along the sidelines. Again, I’m not sure if this was standard for the tours – or if it was just our guide – but rarely have I experienced a more physically accessible tour. In many ways, the tour felt like it was of a treasured heritage structure – and important symbol in the community – and not just a big, modern football stadium. Many of the artefacts on the walls in the venue re-enforced the legacy of the stadium (such as old jerseys and photos of players and of the stadium), and that the present physical incarnation was, in some ways, repository for that history and those memories. Of course, our guide was very good at weaving his own heritage into that of the stadium, though I would hardly call him a weepy nostalgist. He re-enforced that many of the decisions – even the name change – are simply part managing a contemporary club, one that needs to compete for labour in a global marketplace. Similarly, when speaking about the changes to the city proper, it was one mixed with pride and sadness. Certainly, Newcastle appears to be a city on the rise – and has become much more cosmopolitan, even in the dozen years since I had lived there. But, those changes have come at a price, and changes such as the demolition of the near-by Newcastle Breweries (and the fact that Newcastle Brown is now brewed outside of Newcastle itself) can be challenging for long-time residents. In some ways, the tour re-enforced that the stadium – as a symbol of the team – would be ever present, even as the city around it changed. By Gregory Ramshaw in Uncategorized on July 15, 2013 .